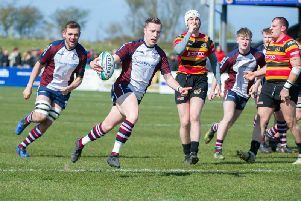 Scarborough RUFC coach Simon Smith can’t wait to return to his former club Bridlington for Saturday’s crunch North One East derby encounter. Smith’s side hammered highly-fancied Bradford & Bingley 53-33 in their opening encounter after winning promotion from Yorkshire One last season, and the coach admits he’s keen to see his troops carry their momentum into Saturday’s East Coast derby. “I set the lads a short-term target of two wins from the opening three games, and if we continue where we started on Saturday at Bradford & Bingley, we could achieve that and maybe even more,” Smith said. The Scarborough coach (pictured below) admits he still harbours a lot of affinity for the Dukes Park club, where he played for 14 years. He added: “Bridlington is a club I still have a lot of time for, clearly my loyalty lies with Scarborough now, but Bridlington is always the second result I look out for.